Hello guys I was curious to see if Red Rocket is available in a large amount for a workshop. Just Pm me if you have any sources.Not trying to step on no ones toes but I'm not interested in small amounts and high prices. Hi there, paulg. Welcome to Derbytalk. I have Red Rocket but I chose to use Liquid Glass a couple of years back. A pint of Liquid Glass was $20.00 when I bought mine. I'm curious, are you dealing with scouts? Using wax is an extreme in building a fast car. I can understand why you might want to demonstrate it to educate your racers but I doubt wax gives much of an advantage, if any, against the scout following science from start to finish. Tell us about yourself and your interest in Red Rocket. My mind is always open to things if it is proven to give me a speed advantage. 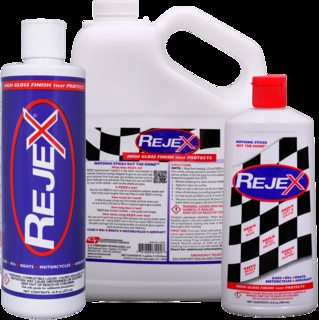 I have heard from more than one source that Red Rocket is just Rejex brand wax, with some kind of colorant added to it. Whether or not this is true, I can tell you that Rejex makes a fine wax for wheel bores. Liquid Glass works well too. Either should do you fine for Scout Racing. If you are using graphite, bore wax helps, but is less important. For oil lubes, bore wax is more critical. Legend liquid glass and Liquid Glass has been difficult to near impossible to purchase.Maybe Rejex is something We could try. We are also setting up some monthly local fun races for kids and adults I'm pretty sure that will get serious..lol. Paul, you are apparently correct. I could not find Liquid Glass anywhere. Perhaps they went out of business. I don't think they call it Liquid Glass any more? Paul, it takes very little wax to do a set of wheels, a small bottle of Red Rocket would likely be enough for your whole troop. As others have pointed out, though, if graphite is the lube then using wax isn't as important as it is with oil lubes. With the wax, you want to keep it fresh so don't invest in a big bottle. It will go bad before you can finish it. I use my wax on my trucks so I buy a new bottle every year at least to keep it fresh. I would go with the Rejex. You can also get a can of Max-Pro Heavy Duty Silicone spray. It works great on the axles (for use with krytox) and you can also spray it on a swab, wait 30 seconds for the propellant to evaporate and use it as a bore prep. For scout level stuff, it is great. I got Rejex from Amazon. It works like a champ on my truck's headlights, too. Easier to clean bugs and other junk off. As far as the old-school Liquid Glass....it's still made. To many tree huggers there? Paint, lube, wax ... to name just a few things. Most annoying.